Fails repeatably with "DBus error org.gtk.Private.RemoteVolumeMonitor.NotFound: The given volume was not found"
I'm trying to reformat a 4GB USB stick using usb-creator to put karmic-moblin-remix-i386.iso on it. 3. I select /dev/sdb and click "Format"
4. I get a dialog with "Unable to mount 4.0 GB Filesystem" "DBus error org.gtk.Private.RemoteVolumeMonitor.NotFound: The given volume was not found"
After that, usb-creator shows only /dev/sdb, and lets me format it, though the UI freezes while it does so and Nautilus opens on top of the window. I dismiss Nautilus, and /dev/sdb1 appears in the list, and I can select "Make startup disk" which seems to be working. Would be good to know if this is reliably reproduced. It's important to be easy to spread Ubuntu this way. After it completed, the drive was still mounted. Is this intentional? I can reproduce it too and workaround does work. This can be reproduced outside of usb-creator by calling the PartitionTableCreate dbus method of devicekit-disks with the 'none' parameter on the disk block device (wipe the partition table). It appears to be a bug in nautilus. Not sure what is the nautilus there by reading the bug, could you give some details Evan? Is that because the drive gets mounted? i have the same problem. workaround by matt did not help. usb-creator show thet there is no space on the usb.. Same problem. Work around does not work for me either. Same problem Workaround did not work for me. Eventually I was able to get it to work. After several failed tries, the drive was not visible in nautilus, but was still visible in usb-creator. This was not the case in previous attempts. I select sdb1, rather than sdb and it worked. Same problem, workaround didn't work for me either. I can't format the 8gb sandisk memory and if click on install i get the message "install failed". Same problem and workaround didn't work for me. You guys are talented, but all of this code is not needed. Does the workaround work? Yes, but there are methods now that are understandable to most of the public, which is ok, and really just comes down to good logic (in other words, get done quickly and cleanly). Click applications -> terminal -> and write the following without quotation marks- "sudo apt-get install gparted"
Step 2: reformat the usb drive. Open terminal and write the following without quotation marks- "gparted" -> click on drop down menu on the top right and make sure to DESELECT!! \dev\hda, and find the right hard drive. If you have a 4GiB hard drive, look for a 4 GiB for volume size, then reformat it. The same problem, work around works. Issue happened to occur to me for a mobile broadband modem which is connected through USB to my Sony Vaio Laptop. This is though not always the behaviour and most often is as described in https://bugs.launchpad.net/ubuntu/+bug/477679 . The cause seems to be though the same. However, workaround presented here is not applicable for a broadband mobile modem. Notice: The system have been completely updated at 13th of November, so I don't know if the committed fix really have fixed the issue. Have used both fdisk and gparted workaround without luck. Still get "Installation failure" when i use USB-Creator when trying to make with a desktop iso-image of karmic. I solved my problem. I am swedish and the folder i had the image in was "Hämtningar" witch means "Download" in english. I realised that maybe USB-Creator do not have compatibility with utf-8 characters. And viola! After i moved the image to my home folder it worked. I have made the same procedure like "revoltism" and everything just worked. I have downloaded the ubuntu image file to "Плот" ( Plot ) which in English is translated like "Desktop" . I have followed the instruction / work-around from revoltism and it worked. I run US ubuntu, so it is hardly related to the utf-8, and the folder I had it in was also the download folder. I moved the folder to my user home folder and after having formated the stick to ext3 it worked! I use Ubuntu 9.10 64 bit. Confirmed, Ubuntu 9.10 64 bit. 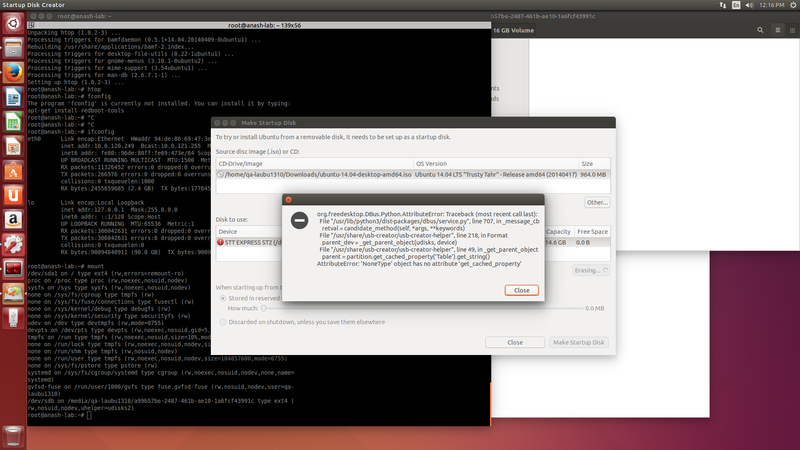 I just format drive on Gparted and then i was able to use usb-creator properly and put ubuntu installed info the stick. Please add information how you fixed it. I'm setting this to Invalid for Nautilus since that doesn't have anything to do with this, or shouldn't have any influence on the way USB Creator behaves. Feel free to reopen it if you have evidence that show that Nautilus is secretly messing with the formatting of USB sticks. Reformatting drive with Gparted did not fix dbus error for Sandisk Cruzer 4GB drive. For everyone with problems, make a FAT32 partition at the beginning for Windows computers and at the end, make at least one FAT16 partition for usb Ubuntu and restart the creator. Moving the file from the directory with swedish letters in the name worked for me. I second ruffneckc's vote for the phedon post earlier. Then I was able to select the volume not marked with an exclamation mark, set my size for stored data as 1Gb and away she goes! Thanks for the original poster phedon's contribution. Occured also on two 4Gig Sticks on two Netbooks with same installation. I am experiencing the same difficulties with Usb disk-creator. Formatting the stick outside the program (like ruffneckc suggests) works. Might there be something wrong with the formatting options in the program? By pressing the "format" button repeatedly on both entries it somehow managed to finally format the partition and I could go ahead with the installation. Unfortunately, due to random key presses I don't know what sequence actually solves the problem. Before I came upon this bug thread, I was able to get it to work correctly by creating a vfat partition and then manually formatting it. Once this was done, the usb-creator worked correctly. It is a problem with the formatting portion. Using gparted to format first does seem to work, but that's not a realistic workaround for end-users, who would never figure this out on their own. What's makes things worse is that usb-creator's attempt to format the drive leaves it with a corrupted formatting, causing it to be useless until you use gparted to reformat. Not good. I'm too am a swede so I followed revoltism's workaround moving the .iso to my home folder and it worked like a charm. Same thing, i followed revoltism's workaround and it worked well. I can confirm that the problem is still there. After using " sudo mkfs -t vfat /dev/sdb1 " and a reboot, the function is normal. It afects me but none of the workarounds worked. Please don't open tasks without a reason. I tried all of the suggestions and nothing worked. I finally did get it ot work. The key in my case seems to be to limit the size of the partition. I I made it 1GB. I was using a 16GB stick. I did this with parted. MB where 1000MB = 1GB. Sometimes it was fine without the format. After this I could start the create. PS After several unsuccesfull attempts (with usb creator) to write iso to preformated into FAT32 usb stick gparted could not recognize its formating. It was blackened. Another tip, if you have a CD-ROM in the drive, it shows up in the list and there is a bug calculating the usb drive size needed. I had a DVD that was bigger than the size of my USB stick, and even though I selected a small ISO image to put on the thumb drive, it was using the DVD's size to do the calculation. I removed the DVD, and then restarted the program and selected the ISO again, and it worked. This is such a useful tool, why are many of the bugs unassigned? How does one generate 'heat' for a bug? "DBus error org.gtk.Private.RemoteVolumeMonitor.NotFound: The given volume was not found"
But I frequently get the error of "Device not found : /dev/sr1"
It happened after I have upgraded to 9.10 from 9.04 which was twice upgraded from 8.04 to 8.10 as well. I dont anymore get the automatic Mobile/EDGE modem connection working in GUI mode. But works fine from LiveCD. I also cant use gnome-ppp to connect. Only being able to connect using wvdial from terminal. But I have to troubleshoot a lot. Please help me give you more technical info which you might need solving this. heat is generated automatically and you should not game the system. Seems to have worked. It took some effort to find this solution. I hope this Bug can be remedied for the sake of more inexperienced users. I got the problem .too.and after this ,I got a new problem ,when the progress bar arrive at 81% ,it can not go further,and a tip "checksum do not match ,retry? ".I tried ubuntu-9.10-amd64 and ubuntu-9.10-i386 ,and ubuntu-9.04-i386.the problem is the same. Tried the trick suggested by Revoltism. Worked really well. Don't forget that in order to copy or transfer the ISO file to he Home folder, you need to login at startup as root. When the Create a Startup Disk button becomes active, just click it to effect the wanted action. Thanks, Revolutionist for your Swedish know-how. Oops! I mean thanks Revoltism. i've got the same bug. I'm french and the default folder for download on Karmic is "Téléchargement". I moved the .iso in my home directory and it's works. Six months later I've found out I have this bug too. My folder names don't have any special character but I moved it anyway to my home directory. Then I zeroed the first megabyte and format the drive to vfat. Only after all this 3 steps usb-creator allowed me to procede. I just tried USB Creator for the first time on 9.10 and can confirm this bug is still there. Everything seems to work fine if you don't use the format option. Having read some of the other comments here I'm a little bit perplexed that some people think a workaround is good enough. If a user interface displays an option to format, that is exactly what it should do. Confirmed. The mkfs workaround worked for me. Did have the exact same problem. "I solved my problem. I am swedish and the folder i had the image in was "Hämtningar"..."
Same issue wtih the Hungarian "Letöltések" folder, and solution, thanks! I am french and the folder for my iso was "Téléchargement". Without accented characters it worked. Same problem here. Formatting the drive to fat32 (dare I say it!) worked for me. I don't know what the original format was. I tried reformatting to ext3 with gparted. Same problem until I reformatted to fat32. Unable to format stick while other usb drive was mounted. unmounted/plugged the other usb drive and was able to install after program restart with minimal difficulty. Thanks revoltism: my Ubuntu is using a french localization, with a folder called Téléchargement instead of Download. Like NicoDup, a simple move of the .iso file in an another folder (without special chars in the name) solved the issue (or mare accurately: is a work around). I've got a duplicate, bug 525906, that says it's fixed in 10.04. Can anyone reproduce in 10.04? What is going on with the vandalism in this bug? Invalidating CentOS task. Bug existed also on Karmic, fed up with it. Formatting the latter manually using parted and chosing it as the target device seems to allow usb-creator to proceed without the error message. Not yet tried does the stick boot, though. Mikko: is this in Lucid? What a solution of this problem? Could you tell me what i can do with this problem? > Unknown keyword in configuration file. > What a solution of this problem? Could you tell me what i can do with this problem? Wilbert Volkers fix worked! (Comment #59). This is a really insidious bug. I'm impressed with all very smart people trying to help here. Folks like this make the Internet a great thing. Thanks, Wilbert. Can someone please confirm that this is still a problem in Maverick? Thanks. I am having this problem on one of my maverick machines. Last update was that this was affecting maverick. Is anyone able to reproduce this in oneiric? usb-creator-gtk is not able to wipe the first partition of my USB drive, but when I wipe it with rm -r from a terminal window, I can use usb-creator-gtk to create a working persistent live USB drive, although I sometimes get segmentation fault, which is probably another bug. Please don't change status without a comment. Thanks. As far as i know from the version 8.04 it is still buggy. I experienced a very similar error, but not exactly the same, when trying to format a 4G USB 2.0 device. Matt's suggested workaround (near the very top of this report, using dd) worked after a couple of tries. I was getting "DBus.Python.GLib.Error" when trying to format, with the same consequences as described in this report.